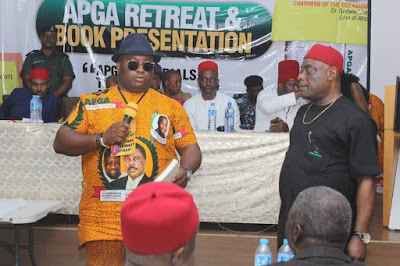 The Senatorial aspirant for the 2019 Anambra South Senatorial District, Dr. Patrick Ifeanyi Ubah had been commended for the great role he played for the survival of All Progressives Grand Alliance (APGA) during. The former National Chairman of APGA, Senator Victor Umeh while addressing participants at APGA 2018 National Retreat and Book Presentation in Awka said: “I also thank those who contributed immensely at a time in 2012 when the former Governor Peter Obi who benefited from APGA decided to fight the leadership of this party. Dr. Ubah who is also the Chief Promoter of Afa Igbo Efuna and Chairman/CEO of Capital Oil & Gas has been committed towards the betterment of the Party and the Igbo race.